Training is an essential part of dog ownership. Once you have your new puppy or dog it is worth considering attending puppy training classes. This will provide your puppy with vital socialisation skills and give you valuable training techniques and the chance to meet other new puppy owners. There are various methods that can be used in training such as treats, clicker training and whistle training. We would recommend you find a trainer which uses positive training methods take a look at : Association of Pet Dog Trainers (APDT). The APDT is a voluntary organisation established to improve the welfare of dogs and the competence of dog owners through the promotion of training skills and techniques based on up to date, researched, methods that apply the principles of kindness fairness and effectiveness and are in keeping with modern learning theory. If you have an older dog or have maybe taken on a rescue dog that requires training there will often be a class to suit your needs. If you have a specific problem you can ask your trainer or behaviourist to visit you at home for one to one training. There are many books that are useful to read whether you are thinking about getting a Cockapoo or already have one. As we have discovered, you can always learn more! Below we touch on simple training techniques but we recommend that you always follow professional training advice through classes or reading a training book. Puppies bite and nip when very young. It is a normal part of puppy behaviour and play biting is how your dog learns bite inhibition. When puppies play together if one bites the other too hard the puppy will yelp and play will stop while whilst wounds are licked. The puppy learns that biting too hard stops an enjoyable activity. You will need to act as the mother or other puppy would and if bitten yelp or shout 'ouch' and stop play. If the puppy is too excited then it is suggested that time out away from you for a couple of minutes is a good idea. This will give the puppy time to calm down and energy to subside. Bite inhibition will not mean that your dog will never bite but it will hopefully mean that if your dog does bite it will be without skin contact. Not everyone wants to use a crate but there are advantages for the dogs and for you as owners. If introduced correctly the puppy will view the crate as its den and safe haven. Try covering the top and sides with a blanket or sheet to make it more den like for them. If you decide to crate train introduce the crate at the earliest opportunity. Ensure the crate has comfortable bedding that is easily washed and encourage your puppy to go in the crate by always feeding in the crate and offering the puppy treats or tasty filled Kongs when inside. To encourage your puppy to sleep in the crate move your sleepy puppy to the crate during the daytime and soon they will associate it as their bed. Crate training will mean that you always have a safe place for your puppy to go when you are out or at night time. This will save your furniture being potentially chewed or your puppy injuring themselves when you are not around. For night time you can start off with the crate next to your bed for the first few nights and then gradually move further and further away from you till this is in the position where you want them to be all the time. This is good for puppies who are finding night time routines harder to adjust to. We also advise as a precaution that collars are removed whilst in crate as it is easy for tags etc to get caught etc..which could cause injury/strangulation if the pup struggles to free itself. Using doggy treats are a great way of training your puppy or dog. Try to use natural treats where possible rather than ones that contain lots of preservatives. Your local pet shop should have a good range or you could always try making your own. 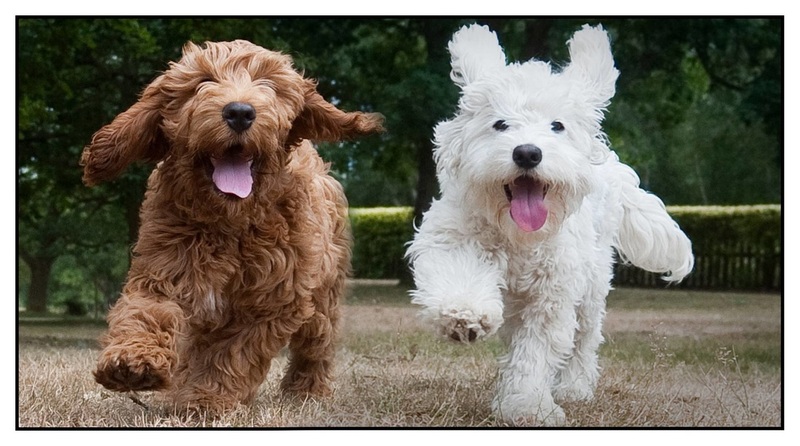 We suggest having a range of treats for your Cockapoo and keeping their favourite ones for the important training such as recall or toilet training. Treats we like include; cheese, dried liver, small pieces of sausage/ Frankfurter or cooked meat (left overs from your Sunday roast). It is possible to buy freeze dried meat treats or you could make your own liver cake if you are feeling more adventurous! An alternative to treats is to measure out your dog's daily ration of kibble and get your dog to earn his dinner through training during the day. Or to fill a kong so they have to get the food themselves or to throw kibble onto the garden so they have to forage for it makes meal times fun and helps them burn off energy. Teaching good recall is essential to happy Cockapoo ownership! If your dog has bad recall you will forever be chasing your dog around the park and you will become a nuisance to other dog walkers. Use high value treats and practise, practise and practise some more! For early walks with your Cockapoo it is worth investing in a long training lead (not a flexi) to give your dog more freedom and to practise recall whilst out and about. See our Recall training Section. The Perfect Puppy is for puppy owners, or would-be owners, who want to know how to bring their puppy up to be a happy, well-behaved and friendly adult dog. Anti-social behaviour in dogs is often blamed on owners, but many are not irresponsible or uncaring, they simply have insufficient knowledge. This book provides that knowledge. Containing the most up-to-date behavioural information, the emphasis of this fascinating book is on prevention rather than cure. Follow Gwen Bailey's advice and you should have no trouble with problems such as chewed shoes, pulling on the lead and aggression when your dog is fully grown. In Before and After Getting Your Puppy, one of the world's leading authorities on dog training and behaviour, Dr. Ian Dunbar combines his two popular puppy-training manuals into one indexed value-priced hardcover edition. In clear steps, with helpful photographs and easy-to-follow training deadlines, he presents a structured yet playful and humorous plan for raising a wonderful dog. Provides busy parents with simple, realistic advice to help ensure that the relationship between their kids and their dog is safe and enjoyable for all. You will learn how to help your child and dog develop a strong relationship, built on trust and cooperation; set your family up for success with a minimum of effort; recognize canine stress signals and know when your dog is getting worried about normal kid activity; identify serious behaviour problems before someone gets hurt; prevent your child from becoming part of a growing statistic - children who have been bitten by a dog. A dog is not for Christmas. This is.John Bradshaw, one of the world's leading dog experts, brings us a compelling insight into what dogs would ask us for, if only they knew how. The dog has been mankind's faithful companion for tens of thousands of years, yet today finds itself in crisis throughout the western world. Until just over a hundred years ago, most dogs worked for their living, and each of the many breeds had become well suited, over countless generations, to the task for which they were bred. Now, in their purely domestic roles we fail to understand their needs. And it is time that someone stood up for dogdom: not the caricature of the wolf in a dog suit, ready to dominate its unsuspecting owner at the first sign of weakness, not the trophy animal that collects rosettes and kudos for its breeder, but the real dog, the pet that just wants to be one of the family and enjoy life. Biologists now know far more about what really makes dogs tick than they did twenty years ago, but this new understanding has been slow to percolate through to owners, and has not yet made enough of a difference to the lives of the dogs themselves. This book is here to set the record straight. The Other End of the Leash shares a revolutionary, new perspective on our relationship with dogs, focusing on our behavior in comparison with that of dogs. An applied animal behaviourist and dog trainer with more than twenty years' experience, Dr. Patricia McConnell looks at humans as just another interesting species, and muses about why we behave the way we do around our dogs, how dogs might interpret our behaviour, and how to interact with our dogs in ways that bring out the best in our four-legged friends.